October 2016 – Please consider this Call for Papers for the American Literature Association Conference to be held in Boston, May 25-28 2017, and please share with anyone you know who is undertaking work on Welty: “Work-in-Progress on Eudora Welty.” The Eudora Welty Society invites short papers that present a section of, or otherwise introduce, your current Welty work-in-progress. Make your case and perhaps also place it among thoughts about what is needed in Welty Studies in the 21st Century. We hope to hear about books underway, articles forming, and dissertations being proposed. We might request a double session, depending on the number of responses to this CFP. Please send preliminary news of your interest in writing for it now to Harriet Pollack, pollack@bucknell.edu, and please follow with 250 word proposals by Dec. 15, 2016. 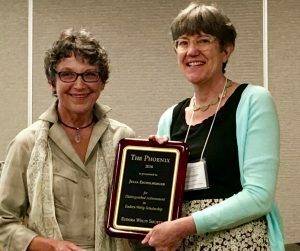 May 2016 – Announcing the 2016 recipient of the Phoenix Award, given bi-annually for distinguished achievement in Eudora Welty scholarship, is Julia Eichelberger, College of Charleston. Her publications help us to better comprehend Welty’s cultural critiques and the histories that contextualize her fiction, as well as to apprehend the importance of Welty’s correspondence and the revelations of archival work. Congratulations, Julia.